What is a campus management system? A campus management system is an ERP software which helps to streamline the administrative and academic activities of a college campus. The software helps to computerize the daily chores of a college campus. In the present era, many colleges facing trouble in performing the administrative activities manually. It is often difficult to manage hundreds of paper-based records daily. This is exactly where a college management system comes to rescue you. To serve you better, it has become mandatory to move towards new technologies and innovations. A campus management ERP system is a total solution to streamline all the administrative activities of a college. Not only it helps in managing the administrative activities, but it can handle academic and non-academic activities as well. Who is online college management system built for? A college management system is obviously built for college campuses. The software can handle colleges of every size, coaching institutes or even schools. It might seem like it is only helpful for college administration and management. But the features of a campus management software is not limited to administrative activities. Teachers, students, parents are all the stakeholders that benefit from this fantastic piece of educational technology. What makes Eduxpert campus management software stands out from other college management software? Eduxpert College management system is tailored to meet the requirements of every educational institutions. 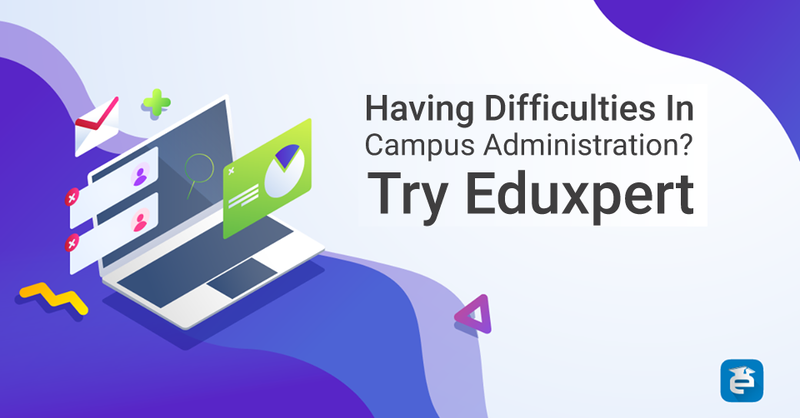 At Eduxpert we understand that every college campus works differently with varying academic and administrative needs.That is why we made Eduxpert Campus management system with high customizabilty and easy to configurable interface. This software has a number of modules to perform various activities of college campus. Every module can be customized as per the college requirement. Apart from the customizability, Eduxpert comes with user friendly design, Secure data over cloud,24*7 software support and many more features. What are the features of Eduxpert campus management erp? Eduxpert campus management system comes with a plethora of features to empower college administrators and teachers for transparent college campus operations, administration, and teaching activities. For a full list of features visit the features page. How much does Eduxpert costs? Eduxpert is absolutely free to try. You can have a 30 day free trial without any credit card details. After the free trial period, it costs according to the requirements of the institution. Thanks for the article. Eduexpert is definitely one of my favorites and belongs at the top of the list for sure. Anyone starting out in purchasing school management software should bookmark this post.